Ignorance – curse or bliss? 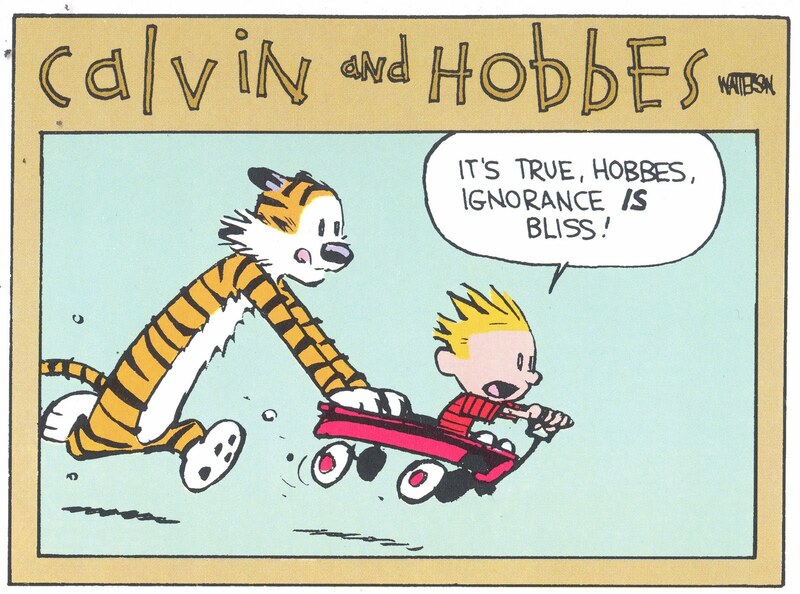 Ignorance is widely considered the curse that prevents human progress, and even the term ‘blissful ignorance’ is usually meant to be derogatory. But could there be reason for a more positive notion of ignorance? Let’s find out. 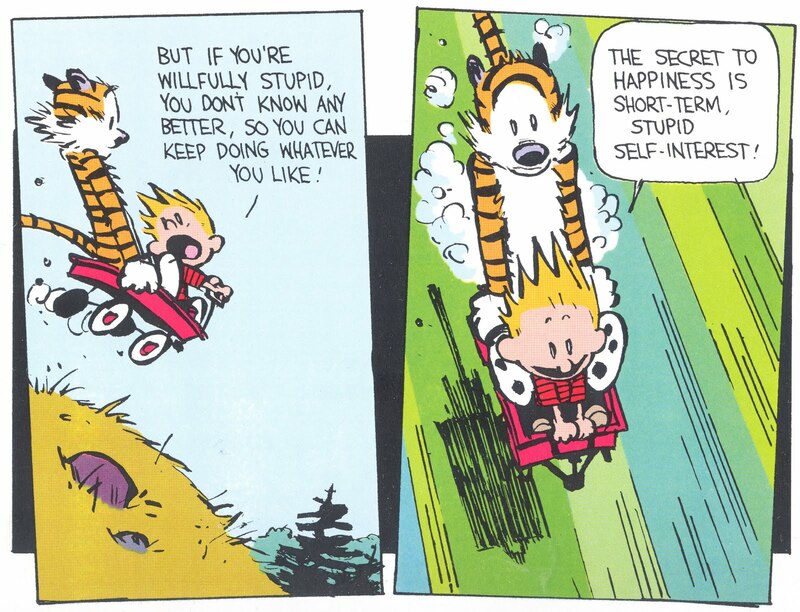 You might take the boyish view of Calvin & Hobbes as a start: “The secret to happiness is short-term, stupid, self-interest.” Of course this is utterly childish, and still many adults would envy Calvin’s ignorance: a state of pure joy without remorse. There’s a deeper truth hidden underneath this seemingly immature perspective. As the philosopher Karl Popper observed: “True ignorance is not the absence of knowledge, but the refusal to acquire it.” Martin Luther King, Jr. held the even stronger view that “Nothing in the world is more dangerous than sincere ignorance and conscientious stupidity.” This doesn’t take a lot of paraphrasing to understand that being happy about one’s lack of knowledge is dangerous. 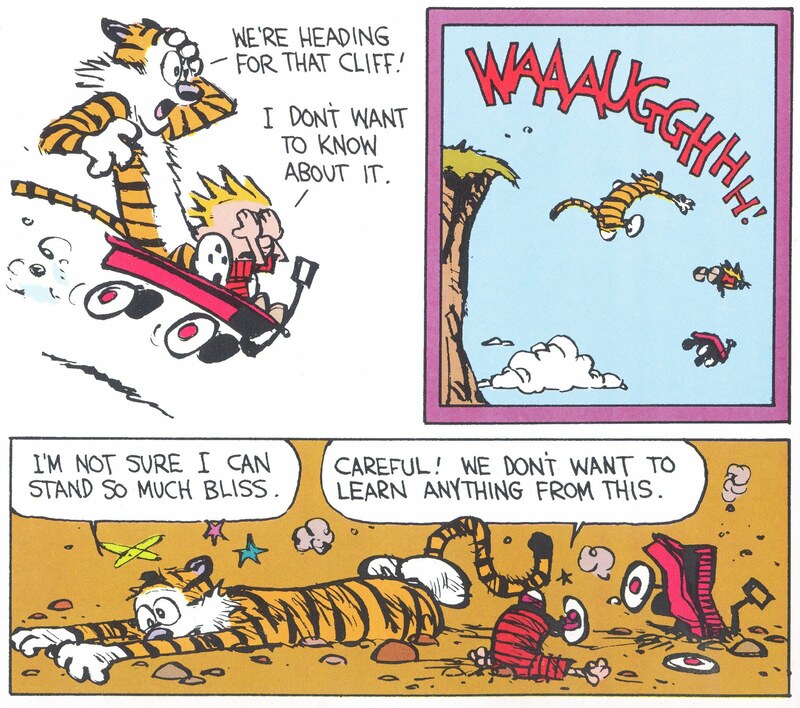 Which is exactly what Calvin & Hobbes remind us of: if you happily focus only on the immediate joy, you’ll go over the cliff. No wonder then that ‘ignorance’ is clearly considered as something negative. Societies all over the planet invest heavily in the fight against ignorance, i.e., in schools and education, in the transfer of knowledge. And that has worked reasonably well to create an ever better educated, an ever more knowledgeable population. At least when you look for averages. When you consider the extreme end of the spectrum, then those previously well educated didn’t gain too much. To an extent, knowledge is comparable to food: a person close to starvation will undoubtedly need more food; in this case, ‘more’ is good. However, somebody who is already obese doesn’t benefit from a simple ‘more of the same’. I fully acknowledge that we still have to lift millions of people out of ignorance; at the same time, I’ll argue that we cannot remain blind for the needs of those on the extreme end of ‘access to knowledge’. And those needs present us with a novel challenge. Here’s why. Historians debate whether it was Gottfried Leibniz or Isaac Newton; but they agree that one them was the last individual you might call a universal scholar: a person to know and understand the collective wisdom of the (Western) world. Since that moment at the turn of the 18th century, knowledge and wisdom have continuously expanded at exponential rates, while our cognitive skills, the inner workings in our skulls, remained largely unchanged. Since that moment, the difference between an individual’s ability to handle knowledge and the volume of available knowledge grew rapidly. Since then, the gap between handling capacity and input quantity exploded. Granted, this is a problem for a small part of any population, but that small part usually entails the innovators and entrepreneurs that generate most of the progress and prosperity we are all looking for. Hence I believe this challenge is vital to all of us; we cannot ignore it. But what could we do about it? Usually, when you realize that your input is quantitatively abundant and you cannot expand your processing capacity, you’ll define some kind of quality control. In our case here, in the context of innovation, the quality you’ll be looking for is the utility of knowledge to help you solve problems. As I’ve argued in the previous post on useful knowledge, that utility is contingent upon context: it depends upon the specific problem that your are trying to solve. Hence your quality control must necessarily be flexible and adaptable. The objective would be to know the limits of your own knowledge, to select what you want to know, and to ignore what you don’t need to know. And most importantly, to do this filtering very deliberately and with full conscious awareness. Such kind of controlled, selective ignorance could focus and accelerate the innovation supply. This kind of enlightened ignorance would be valuable. But is that achievable? What I’m advocating here is a conscious controlled filtering of knowledge, adaptable to specific and changing contexts. In the past, we’ve simply tried to solve our problems by just aggregating more knowledge. But that simple approach has become a problem in itself, as it blindly relied on the mere quantity of knowledge. The question today is: can we devise filters that reduce the quantity of knowledge based on qualitative criteria, based on the utility of knowledge for a concrete problem-solution context? Seems pretty abstract; but is very present. Today’s algorithms, no matter how smart, deal with information first and foremost. They are not tuned to knowledge. While they do try to contextualize information, they often do that through correlation rather than causation. To employ these algorithms in filtering for useful knowledge, they do need to advance to handle knowledge proper. Today’s algorithms are people-oriented, not problem-oriented. 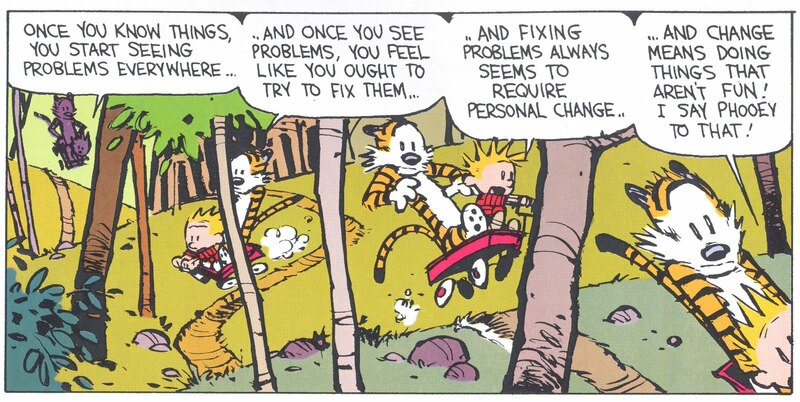 That’s logical, because people generate revenue, problems don’t. But for the filters I’m looking for, we’ll need to focus on problems and their potential solutions. Today’s algorithms filter according to your likings and preferences. The result is therefore based on your past history, which is the exact opposite of novelty. As a friend of mine put it: “Facebook is the wrong place to find people who I can disagree with.” These algorithms do only reinforce what you already know; they cannot help you find new people, new connections, new ideas, new approaches; they are not tuned to support innovation. Finally, today’s algorithms are proprietary, they are privately owned, they are part of a company’s business model. In fact they are the ‘secret sauce’, the crown jewel, the competitive business advantage. Hence they are kept under tight control; they are not adaptable to any specific user purpose, let alone to changing purposes. Of course I do appreciate the benefits that today’s filter algorithms offer, and the ease of using them. But that ease and seamlessness shouldn’t fool us. These algorithms work essentially to achieve a business objective: profit. And that’s not the identical with society’s objective of progress through innovation. Therefore, we’ll need to think very thoroughly about ways and means to focus the flow of knowledge through our societies so that the aspiring innovator has easy access to those elements that could actually be useful to solve the specific problem at hand. User-controlled knowledge filters could be an essential building block for an effective and efficient innovation supply chain. However, that would require a different approach to designing and developing such filters. Of all the challenges listed above, ownership is the key question, because it drives most of the design considerations. Instead of today’s privately owned filters that serve a business purpose, in the future we’ll need publicly owned filters that serve society’s needs. You might think of an open software project, or a government-led approach. While either would have their own pros and cons, both would allow to deliver knowledge filters of the kind I’ve described, and deliver them as a public good. For that’s what I believe our gateway to knowledge should be: publicly designed, owned, and operated; accessible free of charge for everybody; adjustable to specific user needs. On average, ignorance is a curse and should be eradicated. But in the innovation supply chain, ignorance could actually be a bliss – provided that we find ways to employ it with control, consciously, selectively; in short: wisely. It’ll be hard work, but that’s the price to pay for joy without remorse. « What is useful knowledge?